I’ve been reading The Guardian since 1978: the year the winter of discontent started and the first test tube baby was born. As a 1980s student I endured days when the paper never appeared because of strikes and days when photos were so badly printed they were impossible to discern. Today’s paper is a miracle in colour – and the writing is as glorious as ever – yet I’m cancelling my subscription. But this is no act of infidelity. I’ve decided after two years that the Guardian’s iPad edition is perfect for me. I prefer pixels to print, at least during the working week. I can read the ‘paper’ at the breakfast table in San Francisco and Sirmione as well as at home in our Buckinghamshire village without looking for a newsagent. I don’t have to recycle yesterday’s paper. And my fingers don’t get mucky with newsprint. I made the decision after weeks of never buying the print edition with my subscriber’s vouchers. Most days, I read the iPad edition over lunch at my desk at work, avoiding the queue at WH Smith for the printed paper. I couldn’t see the point of spending almost £40 a month for the print subscription when I could get the digital version for around a quarter of the price. The Guardian is special. It stands out from the overwhelmingly authoritarian, right wing British national press. It has been a digital pioneer, although it was slow to introduce an iPad edition. Like many, I wonder how long it will maintain a print edition. Yet I’ve surprised myself. When I started reading the Guardian, Times and Telegraph on my iPad, I thought printed newspapers had a unique appeal that would endure. Now I’m not so sure. 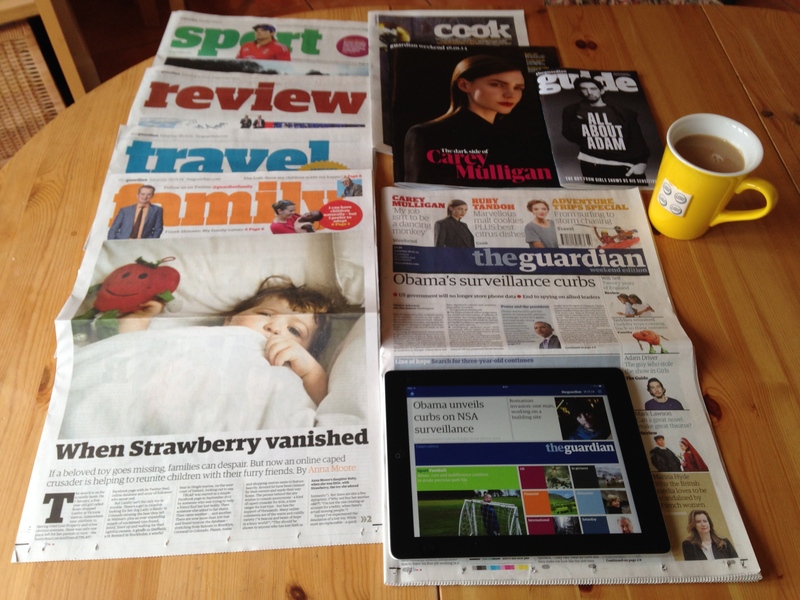 Britain’s papers have embraced the iPad. The broadsheets have become pixel publishers, yet it’s not clear how much money they’re making from their digital editions. But there are two brutal truths: they cannot survive on print alone. And giving away content for free online threatens everything. It will be fascinating to see how this story develops over the next few years. PS: my review of the very first Guardian iPad edition has stood the test of time. You can also read my post about The Times’ iPad edition. This entry was posted in Business, Media, Tech and tagged iPad, The Guardian by Rob Skinner. Bookmark the permalink. Interesting that you still buy the Saturday print edition as that’s the one I still get every week (although missed today as didn’t go near a newsagent). I stopped buying The Guardian every day sometime ago, but instead vary my paper most days (it used to be Guardian plus random one). I still read Guardian everyday, bit via web or app, and not as thoroughly as before. Main reason for me was that newsagent no longer delivers. Interesting, Stuart. As I mentioned, back in the 1980s it was a lottery whether the Guardian would be available, but these days it’s more likely to be my choice whether to get the print edition. Robert, I am afraid I agree . We have been reading the iPad edition of the Times The FT and the economist for some time now. I think it’s because we keep our iPads close so you can always access the news whereas papers get left in rooms . Anthony remarked that he often reads catches up on train journeys too. I have to admit the main time I actually read print news is on a train and as that is rare these days I reverted to the iPad version. I really value the information from these editions and am prepared to subscribe I just hope that there is a way to keep the editions financially viable .i think it is critical that we are all informed and not just by general news. Caroline – I agree, I worry about the financial viability of these papers, and would be happy to pay more to support decent journalism. Absolutely. I see the journalists who work for these papers as people who shed light on really important issues and their work is incredibly valuable which is becoming less appreciated.I think they are key to a really functioning democracy too. Just replying as I cant see a ‘subscribe’ button anywhere and replying and ticking the box when you do so has the same effect! Hope you enjoying your venture in wordpress and can anyone ride/walk over the Severn Bridge? its one of those things that ive always wanted to do but wasnt sure if you could actually do it!